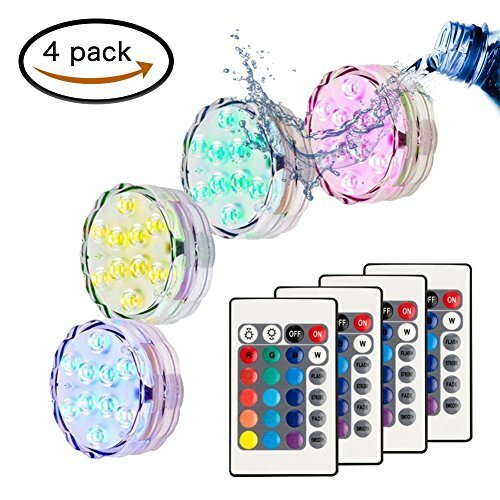 MOONBROOK Submersible LED Light (4 pcs), Waterproof Multi-Color Pool Light Pond Light Remote Control Hot tub Fountain Vase Decoration Light Garden Wedding Halloween | Fountain City Art Ctr. 1. Check if the waterproof ring is in correct position, then screw up the cap clockwise properly and tightly before throw it into water. 2. The LED lights are made of high quality double waterproof materials, no worries when submerged. 3. Battery continuous use time can be more than 24 hours(The operation mode of the different results may be different).When the battery runs out; the lights stay stuck in red,if no longer switching between colors and remote does not control, at this time only need to replace the battery, you can solve the problem. 4. Battery options: normal use - dry batteries; heavy use - rechargeable batteries may save cost and increase working time. 5. IR Remote control range is 24-30ft in open area, operated by 1×CR2025 button cell battery. - 16 different static colors, you can press color buttons directly to select single static color for the lights, such as White (W), Red (R), Green (G), Blue (B) and other mixed colors. - Brightness: press Up or Down button to increase or reduce the brightness of static lighting. - 3 dynamic color changing modes. Halloween, Christmas, Wedding, Decoration, Centerpieces, Flower Arrangement,Table Settings, Ice Sculptures, Vases, Aquarium, Graduations, etc. Swimming Pool, Hot Tub, Pond, Ice Bucket, Fountain, Waterfall, etc. Fish Tank, Indicator Light, Night Light, Novelty Light. ★COLOR AVAILABLE -- Each light has 10 super bright LED beads,16 static colors and 4 dynamic lighting modes: flash, strobe, fade, and smooth. ★WATERPROOF GRADE -- IP68 Waterproof Level, Made of high quality waterproof materials for any water filled containers.Make sure cap is completely closed before submerging in water. ★BATTERY POWERDE -- it will run from 10-20 hours on three AAA batteries(which not included),And easy to replace. ★REMOTE CONTROL -- Come with 4 IR remotes, which allows for convenient operation about dimming and ON/OFF,and control the lignts up to 30 feet. ★MULT-USE LIGHTS -- Perfect for event party or home decoration accent lighting , like lighting up vases, bowls, or any water filled containers. Also can perfectly apply to Disco, shopping malls, jewelry stores, showrooms, showcase, cabinet, museums, shops, Wedding, Halloween, Party, Christmas, Fountains and other occasions. If you have any questions about this product by MOONBROOK, contact us by completing and submitting the form below. If you are looking for a specif part number, please include it with your message. OMWay Solar Fountain Pump, Solar Powered Bird Bath Fountain, Solar Birdbath Fountain, Solar Water Fountain, Water Fountain Pump, Outdoor Floating Solar Bird Bath Fountain Pump for Garden Pond Pool.